Two amazing gourmet dinners will celebrate Tasmanian food and showcase the Tamar Valley region during the 2018 Farmgate Festival. On Friday November 23rd, the festival will begin in spectacular style with a 5 course dinner to be held at Strathlynn Wine and Function centre. Sweeping views of the Tamar Valley and an idyllic setting among the banks of the Ninth Island Vineyard will greet excited guests. Diners will indulge in an array of seasonal, local and organic produce in a celebration of Tasmanian flavours. Matching wine will be served for a truly sensational degustational experience. The following evening, guests will be welcomed warmly to Timbre Kitchen in Legana for a lavish 4 course dinner. Led by mercurial chef Matt Adams and supported by passionate staff, diners will experience the very best of Tasmanian produce. Produce for the dinner will be predominantly sourced from farms participating in the Farmgate festival for a truly intimate food experience. Wine lovers will be treated to an array of fine wines including vintage sparkling, pinot noir, rich earthy cabernet merlot, pinot gris, chardonnay and Riesling. Tickets for these events are available online at farmgatefestival.net.au. Matt Adams is a rising star in the chef world. 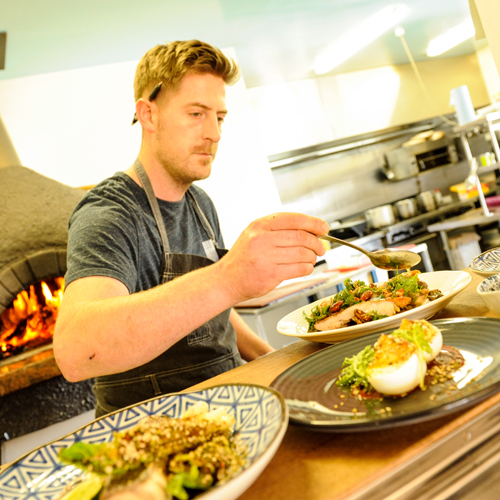 After beginning his apprenticeship on the Sunshine Coast, Matt has established himself working for a range of local restaurants including Fee and Me, Mud Bar and Restaurant, Pierre’s and Joseph Chromy. Matt now owns and runs Timbre Kitchen. Operating out of Velo Wines, the restaurant aims to provide guests with a distinctive and diverse Tasmanian culinary experience. A wood fire, local art, wine barrels and a sweeping view of grape vines and green pastoral fields compliment the honest seasonal produce and extensive wine list of Timbre. Matt enjoys a creative approach to meal creation and is relishes the challenge of bringing different elements of a dish together. He prefers a natural, non-fussy, plate up that is generous and fun. This year will be the second year Timbre have hosted a dinner for the Farmgate Festival. In the lead up to event, we caught up with Matt Adams and asked him about his plans for the 4 course gourmet dinner, what has been happening at Timbre and the Tasmanian food scene. Question: What did you think of the dinner Timbre held last year? MA: It was good, we had Massimo down for that, who I had done some of my apprenticeship with 12 years ago or something like that at Mud, it was good. We did it together, we did his food and used our venue and we sourced produce together. Will you be sourcing food from Farmgate Farms again? MA: We’ll be using the Farmgate farms that are involved as much as possible. Even down to really detailed, tricky and weird stuff like aging with beeswax and things like that, we want to get a little creative with how we’re utilising the products from the farms. We’re thinking about these things anyway. I’ll try to utilise products from the farms as much as I can. What else can people expect from the dinner this year? MA: At Timbre we write our menus really close to the time, we’ll see how we go with this one. We like to gather produce and then not really commit to what we will do with it until close to the time. If we commit we know we’ll probably change our minds and not like what we’ve decided to do. We’ll write the menu quite loosely. There will be things in the lead up where maybe there’s a fruit or vegetable that we’ve aged in beeswax for months beforehand. Just some creative intricacies. We did some beef like this earlier in the year, that was different. That kind of creative approach is something you try to bring to your menu? MA: Yeah, for us it’s local. We do a lot of backyard produce trading with just the general public. The last two years we’ve done that. We have people that will come every week with produce from their backyard garden and we’ll trade with them. That’s how our product comes together and it writes out menu. It’s rare that we would turn any product away even if it means we’re forced to pickle and ferment, put it on the menu, change it and change it again. The more parameters you have breeds more creativity. It’s like the world is not your oyster. It makes it easier in a sense when you’re forced into being creative. What do you think of the Farmgate Festival as a whole? It seems to align with that philosophy of celebrating local food. MA: I think it’s a great idea to open the farms to the public’s eyes to get them to see where stuff is actually coming from and what is going on in their community. People probably drive past the farms on their way to work and they don’t even realise. It’s putting faces to products and making every one feel like they are in this community. The ultimate aim is to get people thinking about what they’re eating and supporting these smaller holdings. What are recent things that have been happening in your career and with the restaurant? MA: Timbre is still being well received in reviews. We try and fly under the radar a little like the underdog. There are always dreams like another place in town. We might get there one day. We’ve been doing a few events, we did Junction a few weeks ago where we were roasting whole lambs Argentinian style. We did Festivale earlier in the year and that went pretty well. Is the gourmet and local food movement in Tasmania growing? MA: Oh yeah! Especially locally like with Farmgate, with produce to the customer the connection has become smaller. It’s less mysterious now and chefs have to be more honest. As far as the restaurant and dining scene, Hobart are absolutely killing it and that feeds up into Launceston a bit as well. With higher tourist numbers and people being more food and wine focused in their travels, especially coming to Tasmania, that’s a big part of why they come. We find the peak tourist season has stretched out a lot more from what I remember ten years ago. What used to be a three or four month peak has now stretched out a bit. There’s only two or three hard months to get through now and the rest is either building up or winding down to peak season. Matt Adams will be hosting a gourmet dinner for the Farmgate Festival at his restaurant, Timbre Kitchen on Saturday, November 24. Tickets can be purchased now from farmgatefestival.net.au.